Social justice warrior and displaced NFL quarterback Colin Kaepernick has remained relatively mum on the subject of his silent protests and his feelings about his current employment situation, but perhaps we are about to hear from him in his own words, and not through the filter of a reporter. Page Six reports that Kaepernick recently signed a deal with Random House imprint One World that’s worth just over $1 million. A previous report on Page Six said that Kaepernick was shopping a book and had been seen “taking meetings with publishers in the New York offices of WME.” Kaepernick is represented as an athlete by William Morris Endeavor agent Carlos Fleming. Kaepernick made national headlines last season when he began kneeling during the national anthem as a form of protest against the often unjustified and unpunished killings of black men by police. 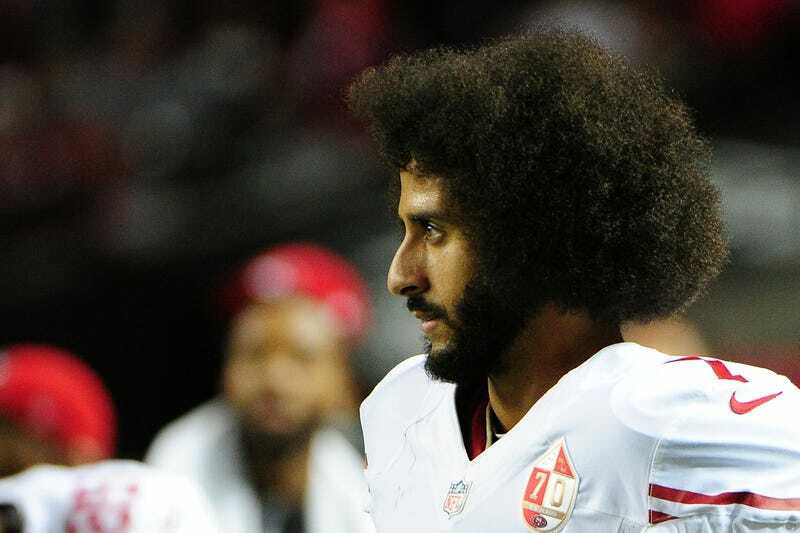 He opted out of his contract with the San Francisco 49ers earlier this year, and it is a common belief that his protests have led to his being blackballed by the league. Kaepernick recently filed a grievance against NFL owners, alleging collusion on their part to keep him out of the league. Other players have picked up the torch and are kneeling during the anthem both in support of Kaepernick and in solidarity with his protest. The NFL does not require players to stand during the anthem, but last week, NFL commissioner Roger Goodell said that he would prefer if they did. Seattle Seahawks defensive lineman Michael Bennett took a stand and said that not only would he remain seated during the national anthem, but before the league and players could move forward to a resolution, Kaepernick needed to be a part of those talks. For now, neither Kaepernick nor One World has responded to inquiries from Page Six. But the very idea of hearing Kaepernick tell his story in his own words has me ready to preorder a book that may not even exist.